We were entertaining at the weekend and this was our starter. I do believe it was the meal of the evening. Never has a plate of food been so well received. It is all served cold and quite simple to produce. I bet many of you will be book marking it for future reference. This recipe will work well with any smoked meat or fish. If you just want to buy some smoked salmon from the shop it’ll be fine. The sorbet has a mousse like texture, rather than a granita type texture. This is all down to the liquid glucose. This ensures that you don’t get many sugar crystals in the final mix. If you’ve never used it, give it a go, the results are amazing. Make the sorbet by bringing the sugar and water to a boil. Add the glucose, beetroot juice and lemon juice. Squeeze the excess water out of the gelatine and stir in to the warm mixture. Cool and transfer to an ice cream maker. Place in freezer until needed. For the salad, just assemble all of the ingredients. This can be made ahead or at the last minute. It makes no difference. It’ll be perfect in the HK heat, Bam. I love that sorbet. I had some similar to that on a first-class long haul flight a few years ago and I kept saying I was going to make it. I never did. Now I don’t have to think about it — I can use your recipe! It was so nice I’d even use it in dessert. 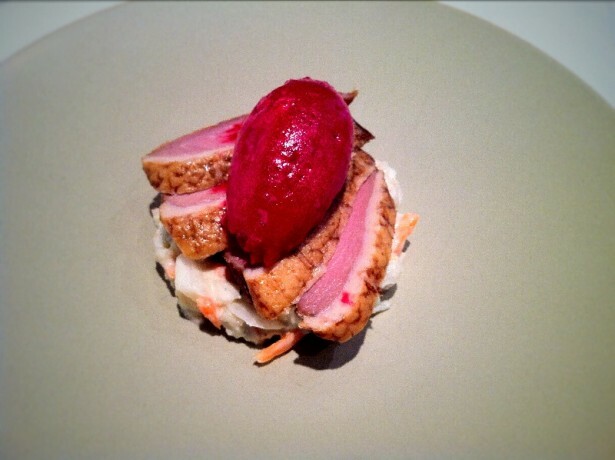 I wouldn’t have thought to add a sorbet to a starter dish David, very clever. The contrast in temperatures and textures must have been amazing. The colours are rather lovely too. By the way, although the words in your blog are reformatting for my smart phone, your images are not. Thanks Eva, if you have selected “view mobile site” on your phone it sometimes plays with the photos. I’ve deselected it from my feed so you should just get the normal site. I aim to please Dan. David, I wish you weren’t so far away…I would love to invite myself to one of your delicious dinners. This meal really speaks to me. Like Karen, I’d like an invite too! This looks gorgeous David! I am loving the beetroot sorbet, just beautiful! This really looks so fancy and delicious. Great work. It’s not fancy at all, Amira. Although anyone you serve it to will. Each and every meal that you post is so inspiring. I think I really do need to buy an ice cream maker this year. This dish sounds fantastic. I love smoked duck, and this is really gorgeous! What a unique way to eat it with beetroot sorbet. I’d love to have this dish, David! Hi Nami, it’s a great prepare ahead dish too. You can spring it on your guests without warning. We love duck, too, but I’ve never made it at home. This is such a beautifully composed dish. Really wonderful. Wow David – love the simple, elegant beauty of this dish. I am sure moans were heard around the table. Love your blog – can’t wait to explore and visit often! Have a lovely weekend. Sorry if I’m being rely dim but how do you make ribbons out of celery? Also from the picture it looks like there’s carrot in the salad as well? I really want to make this but want to get it right. Just use a potato peeler lengthways on the celery. I also just finely chop some pieces for texture. There is a little bit of carrot in the salad. I had it lying around. It works ok, but it’s not essential.